The socio-environmental issues such as increasing world population, globalization, environmental concerns, and energy security lead to utmost need for utilizing biodegradable agricultural wastes for the production of biofuels. Therefore, the focus is to deploy technologies for utilization of renewable lignocellulosic sources, which are available worldwide in copious amounts, for the production of second-generation biofuels. Lignocellulosic ethanol is considered as one of the environmentally-friendly alternatives to fossil fuel, which is produced by exploiting lignocellulosic biomass using different techniques. There are three major steps involved in bioethanol production: pretreatment, enzymatic saccharification, and fermentation. Pretreatment allows increasing surface area and getting accessible cellulosic material to hydrolytic enzymes; this is further hydrolyzed to fermentable pentose and hexose sugars through enzymatic saccharification. The overall economy of the process depends on pretreatment, enzymatic saccharification, and utilization of both pentose and hexose sugars to ethanol. The integrated fermentation approaches result in simultaneous saccharification and fermentation to enhance bioethanol yield and productivity. The development of industrial strains for bioethanol production is another challenge to utilize both pentose and hexose sugars, and withstand under adverse environmental conditions, i.e., high ethanol and inhibitors tolerance, and tolerance to high temperature and low pH. The present chapter focuses on pretreatment, enzymatic and co-fermentation strategies, integrated approaches, and optimization on process parameters to enhance the lignocellulosic ethanol yield for sustainable biofuel production. The authors are thankful to Department of Biotechnology, Punjabi University, Patiala, India, and Bhai Kahn Singh Nabha Library, Punjabi University, Patiala, India, for providing access to technical and scientific literature. 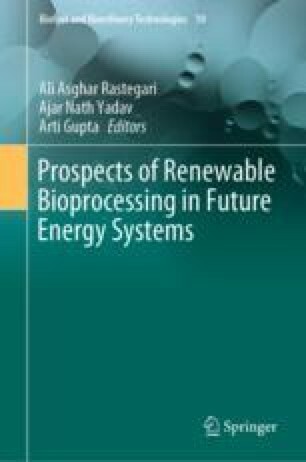 The authors also acknowledge the support from Sardar Swaran Singh National Institute of Bio-Energy, Kapurthala, India.